"Everybody has a book inside them - but it doesn’t do any good until you pry it out." Well, best-selling author, Jodi Picoult, is partly correct in making that statement, however, the challenge is what to do with it after it is pried out. It won’t do any good until it is published! Most first-time authors are rejected by publishers, so what do they do if their manuscript has been turned down? This book will provide them with a practical alternative i.e., self-publish it. It starts by giving readers hints on how to prepare their manuscript and use the Internet to conduct their research. It introduces them to some of the computer software that can help them. Then it suggests different ways to edit and proofread their document. It covers all the important cataloguing, copyright and legal stuff. Readers will learn how to publish print books and how to advertise, market and sell them online. Then, it shows them how to prepare eBooks; the different formats; how to handle covers and some of the self-publishing alternatives that are available. Also, they will learn how to sell their eBooks through resellers and the importance of metadata to help in the "discoverability" of their titles. It discusses Digital Rights Management to protect their content; the issues around pricing and offering free content. Finally, it looks into the future; what the publishing industry will look like and the social consequences as the publishing industry continues to go digital. Every author should read this book which is written under a pseudonym by a publisher with many years of experience operating a small publishing company. It is packed with inside information that will help every aspiring author self-publish their own print books or eBooks. 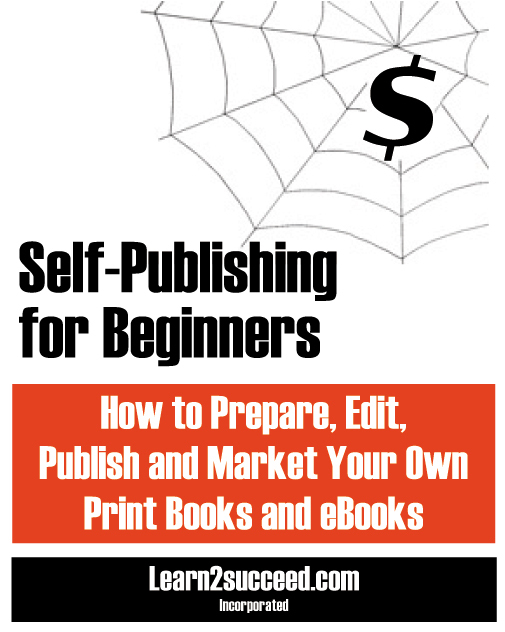 Self-Publishing for Beginners: How to Prepare, Edit, Publish and Market Your Own Print Books and eBooks by: Learn2succeed.com Incorporated: Softcover; 158 pages; ISBN: 978-1-55270-488-2 published in June 2014; $24.95.